I don't usually share too much about my personal life on here, but today I'm making an exception. My dad has been having trouble with his left eye and we found out 2 weeks ago he had a detached retina and macula. A detached retina can usually be repaired with very little loss of sight, but a detached macula usually means major loss of sight. He had surgery yesterday and we are hoping and praying for a complete healing. We won't know for about 4 weeks how much sight he will get back. I know his health problem is not life threatening and could be so much worse, but my dad is struggling. My dad is always on the go. He's not the type to just sit still for long. He loves to travel and when we go anywhere we are up early and gone all day seeing new things. He has always taken videos of our trips so that he can sit back and watch them when he retires. It breaks my heart to think that he might not be able to do that. If you believe in the power of prayer, I would appreciate a prayer or two for my dad. I have absolutely no doubt that God can heal my dad's eye and let his vision return to normal, but I also know that that might not happen. We are praying for my dad to be at peace and accept whatever does happen. It's been hard watching him over the last couple weeks and I can't imagine what life will be like if things don't improve...but we have a lot of prayer warriors praying for him. We have ended our unit on penguins and my kiddos had soooo much fun. They were sad to take home their penguin folders because they thought we were just going to keep learning new things. They felt a little better when I told them they could go home and tell their families that they are now penguin experts. One little boy shouted that he was going to teach his mom! To end our penguin fun we did a science experiment. We wanted to investigate just how blubber keeps penguins warm. The kiddos put their hands in the bag so they wouldn't get wet... genius for faster cleanup! I put blubber in one bag and then put another bag inside of it so the kiddos wouldn't get their hands messy. They were still a little hesitant to put their hands near all that goop! Some of my kiddos were shocked that they couldn't feel the cold water through the blubber. As they put their hands in the bags I asked them if their hands felt different. Some were so excited and shouted one hand was cold and one hand was warm! After all the kiddos tried it, they wanted my aide and I to do it too. They didn't believe me that I had already done it. I thought it was sweet they wanted us to participate too! 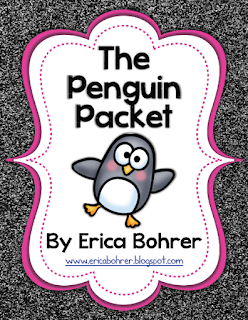 I used Erica Bohrer's Penguin Pack to direct our learning and I highly recommend it. This pack is full of wonderful activities. Click on the picture to go purchase it! What a great idea to use the baggies so there isn't a mess. Genious! Sending prayers for your family and a big hug for you. Prayers for your family! I know someone whose retina detached and it was crazy to me how fast it all happened. The good news is that he's completely back to normal now... hopefully the same will happen for your dad! What a great idea! How about adding some ice to the water for a little bit of extra coldness? !